Wine columnist Andy Perdue chose 50 wines he loved this year — from 50 wineries. They’re all winners, of course, but No. 1 was a 2012 cabernet sauvignon from Woodward Canyon Winery. TWO ISSUES that come up with year-end wine lists: Wines are too expensive or unavailable. These are problems I try to address each year with The Seattle Times’ top 50. It isn’t easy. For example, the No. 1 wine this year rings it at nearly $100. The fact is, many great wines come from meticulously farmed grapes and are, quite simply, expensive to make. I try to temper the higher-priced wines with those that are affordable and readily available. On this year’s list, 14 of the wines retail for $20 or less — not a bad price for a great bottle of wine. Accessibility is an even harder issue. I begin tasting for this list in January, so some wines inevitably are going to be sold out by the time this comes out nearly 11 months later. Additionally, while some wines might be sold out at the winery, they could be available in some retail outlets or on wine lists for a year or more. This is my third year compiling The Seattle Times’ top 50 wines and, as has become tradition, I choose the wines from 50 different wineries. You might notice some prominent wineries missing from this list. All wines I include are tasted blind, meaning I know neither the producer nor the price until I’ve finished evaluating them. Not all wineries submit their wines, so it isn’t fair to include them here. We already know they produce terrific wines, so that leaves room to explore other producers. 1. Woodward Canyon Winery 2012 Old Vines cabernet sauvignon, Columbia Valley, $99: A couple of years ago, owner Rick Small and winemaker Kevin Mott chose not to make the 2010 version of this wine because it didn’t meet their standards. That’s integrity. My wine of the year is from one of the best vintages in Washington history. It is glorious, a wine to drink now or in 20 years. Buy it, cherish it. 2. Owen Roe 2012 Red Willow Vineyard Chapel Block syrah, Yakima Valley, $55: David O’Reilly moved to Washington to live amid the vineyards he loves, and we are the beneficiaries. This is a stunning red from one of the finest grape growers in the state. 3. Seven Hills Winery 2013 McClellan Estate Vineyard malbec, Walla Walla Valley, $30: Casey McClellan has quietly crafted great wines for nearly 30 years. This is a classic Washington malbec with rich fruit and bright acidity. 4. Palencia Wine Company 2014 albariño, Ancient Lakes of Columbia Valley, $18: Victor Palencia makes dozens of wines under four labels, making him perhaps the busiest young winemaker in Washington. This white Spanish variety is simply stunning. 5. DeLille Cellars 2012 D2, Columbia Valley, $45: The DeLille gang continues to impress with all of its wines. This Bordeaux-style red is the Woodinville winery’s most broadly available wine. It’s big, rich and approachable. 6. Barnard Griffin 2014 rosé of sangiovese, Columbia Valley, $12: Owner Rob Griffin’s ability to make one of the best West Coast rosés year after year is remarkable. This is a beautiful wine with aromas and flavors of strawberry, cherry and cranberry. 7. Thurston Wolfe 2012 Zephyr Ridge petite sirah, Horse Heaven Hills, $20: Wade Wolfe is an expert at taming petite sirah’s assertive tannins. This big red is bold and luscious. Drink now or hold for a decade. 8. Obelisco Estate 2012 Electrum cabernet sauvignon, Red Mountain, $70: This Woodinville producer uses estate Red Mountain grapes for its lineup of superb reds. This was easily among the best cabs I tasted this year. 9. Passing Time 2012 cabernet sauvignon, Horse Heaven Hills, $75: NFL great Dan Marino and Husky legend Damon Huard teamed up with Woodinville winemaker Chris Peterson and Discovery Vineyard to craft an amazing debut. 10. Panther Creek Cellars 2012 Lazy River Vineyard pinot noir, Yamhill-Carlton, $45: This longtime Oregon winery has gone through hard times in recent years because of ownership changes. Thanks to winemaker Tony Rynders, Panther Creek is back on the prowl. 11. Gehringer Brothers Estate Winery 2014 classic riesling, Okanagan Valley, $15: Walter Gehringer crafts some of the finest wines in the Northwest in relative obscurity because his wines are never for sale outside of Canada. 12. Saviah Cellars 2012 tempranillo, Walla Walla Valley, $38: The only question with Rich Funk’s wines is which to choose, because he doesn’t miss. I’m falling in love with Northwest tempranillos, and this is delicious with lasagna or grilled meats. 13. Walla Walla Vintners 2012 cabernet sauvignon, Walla Walla Valley, $38: William vonMetzger crafts the wines for this longtime Walla Walla producer, and this cab is one of the finest from the valley this year. 14. Jones of Washington 2014 sauvignon blanc, Ancient Lakes of Columbia Valley, $15: Looking for a perfect seafood wine? This is it. Palencia captures his second wine in my top 15. It is bright, crisp, lean and complex. 15. Maloney Wine 2012 Elephant Mountain Vineyard cabernet sauvignon, Rattlesnake Hills, $65: Josh Maloney’s day job is director of winemaking for Milbrandt Vineyards. His side gig is vineyard-designated cabs, and his inaugural release is filled with robust fruit and assertive tannins. 16. Elk Cove Vineyards 2014 pinot gris, Willamette Valley, $19: Yamhill County winemaker Adam Campbell continues to prove he is the finest pinot gris producer in the Northwest. 17. Mercer Estates 2012 Dead Canyon Vineyard reserve syrah, Horse Heaven Hills, $42: Jessica Munnell’s first vintage as Mercer’s winemaker proves her prowess with this powerful syrah from estate grapes. 18. Amavi Cellars 2014 Estate sémillon, Walla Walla Valley, $24: Swiss-born winemaker Jean-François Pellet is known for his suave reds, but he also deserves acclaim for his luscious whites, particularly this sémillon. 19. 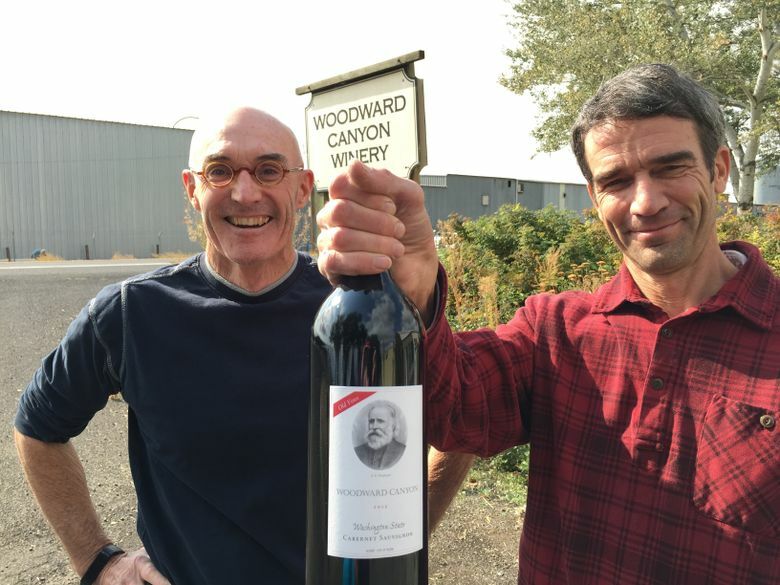 Grantwood Winery 2012 petit verdot, Walla Walla Valley, $22: Joe Grant and Doris Wood work quietly on the outskirts of Walla Walla and remain focused on delicious, affordable reds in tiny amounts. 20. Wild Goose Vineyards & Winery 2013 Stoney Slope riesling, Okanagan Valley, $20: The Kruger clan crafts stupendous white wines, and this stunning riesling comes from three-decade-old estate vines. It’s bright, steely and perfect with shellfish. 21. Cascade Cliffs Vineyard & Winery 2013 barbera, Columbia Valley, $60: This red Italian grape is rare in the Northwest, but owner/winemaker Bob Lorkowski has it dialed in at his small Wishram, Wash., winery. 22. L’Ecole No. 41 2014 Alder Ridge Vineyard grenache rosé, Horse Heaven Hills, $22: Marty Clubb and his team at this iconic Walla Walla Valley winery in the century-old schoolhouse are best known for suave reds, but their bright, luscious rosé is perfect with prosciutto-wrapped shrimp. 23. Mosquito Fleet Winery 2011 Reserve 34 cabernet sauvignon, Red Mountain, $65: Owner/winemaker Brian Petersen is based near the southern tip of Hood Canal in Belfair, and this is his finest wine. He just couldn’t blend away his two best barrels, so he made a separate, yet complete, cab. 24. Côtes de Ciel 2012 Ciel du Cheval Vineyard cabernet franc, Red Mountain, $39: Winemaker Charlie Hoppes crafts the estate wines for legendary grape grower Jim Holmes and his son, Richard. The results are predictable: delicious and opulent. 25. Mt. Hood Winery 2014 dry riesling, Columbia Gorge, $20: A number of small producers in and around Hood River, Ore., are turning heads with stunning wines. This winery owned by a multigeneration farming family is remarkably versatile, and this is its finest effort. 26. Auclair Winery 2012 Artz Vineyard Right Blend, Red Mountain, $39: Woodinville winemaker Charlie Auclair leads with merlot and cabernet franc for this rich, bold red blend. He made just four barrels, so you might hurry. 27. Dusted Valley Vintners 2012 StoneTree Vineyard petite sirah, Wahluke Slope, $42: The Dusted Valley boys continue to produce some of the biggest, richest and most elegant reds in the Northwest. 28. Long Shadows Vintners 2014 Poet’s Leap riesling, Columbia Valley, $20: Germany’s famed Armin Diel teams up with former Ste. Michelle boss Allen Shoup and Walla Walla winemaker Gilles Nicault on this superb riesling. 29. William Church Winery 2012 Gamache Vineyards malbec, Columbia Valley, $38: Woodinville winemaker Noah Reed used grapes from acclaimed Gamache Vineyards to craft this luscious, balanced and rich malbec. 30. Coiled Wines 2014 Rizza, Snake River Valley, $28: Former Napa Valley winemaker Leslie Preston is helping to lead the Idaho wine industry into new directions. This is a remarkable, spine-tingling sparkling riesling. 31. Bunnell Family Cellar 2010 Discovery Vineyard syrah, Horse Heaven Hills, $44: Since leaving Chateau Ste. Michelle more than a decade ago, Ron Bunnell has produced some of the most delicious and expressive Rhône-style reds in Washington at his Prosser winery. 32. Chehalem Wines 2012 Ian’s Reserve chardonnay, Dundee Hills, $40: Owner Harry Peterson-Nedry honors his late son with this superb chardonnay made by Ian’s sister, Wynne, who took over as head winemaker with this vintage. 33. Pondera Winery 2012 cabernet franc, Columbia Valley, $32: This is a classic Washington cabernet franc from Woodinville winemaker Shane Howard. Rich, ripe berries mingle with fresh oregano to create a complex and approachable red. 34. Ross Andrew Winery 2010 Boushey Vineyard syrah, Columbia Valley, $40: Ross Mickel got his start at Betz before launching his own Woodinville winery in 1999. This syrah comes from arguably the best grape grower in the state. 35. Tamarack Cellars 2010 Tapteil Vineyard Reserve, Red Mountain, $50: Walla Walla winemaker Ron Coleman and his team blended cab, merlot and cab franc to craft one of the great red blends I tasted this year. 36. Cave B Estate Winery 2012 sangiovese, Columbia Valley, $33: Chef-turned-winemaker Freddy Arredondo used estate grapes grown next to the Gorge Amphitheatre to produce one of North Central Washington’s finest wines. 37. Plain Cellars 2012 cabernet sauvignon, Red Mountain, $35: This tiny winery north of Leavenworth got on my radar this year in a big way. This cab emphasizes elegance and complexity over richness and power. 38. Maryhill Winery 2013 Winemaker’s red, Columbia Valley, $12: Winemaker Richard Batchelor makes more than 60 wines for this Columbia Gorge producer, and its biggest hit is this affordable blend that combines delicious depth with youthful approachability. 39. Chateau Ste. Michelle 2013 Mimi chardonnay, Horse Heaven Hills, $20: Vineyard manager Mimi Nye helped establish Canoe Ridge Estate Vineyard in the early 1990s, and it’s the source for this deliciously fruit-forward chardonnay. 40. Cinder Wines 2013 syrah, Snake River Valley, $28: Ste. Michelle alum Melanie Krause returned to her native Idaho to raise the profile of the Snake River Valley wine industry. This luscious syrah is a great example of what is possible. 41. San Juan Vineyards 2014 siegerrebe, Puget Sound, $22: Fewer than 100 acres of grapes are grown in the far-flung Puget Sound American Viticultural Area, and this sleek white from a Friday Harbor winery is one of the best. It’s perfect with shellfish. 42. Reustle-Prayer Rock Vineyards 2013 Gloria’s syrah, Umpqua Valley, $42: Stephen Reustle has been establishing himself as one of Southern Oregon’s top winemakers. He named this gorgeous syrah after his wife. 43. Tenet Wines 2013 GSM, Columbia Valley, $70: Ste. Michelle’s new international collaboration is off to a heady start. This Southern Rhône-style red blend is produced with two renowned French winemakers. 44. Van Duzer Vineyards 2014 riesling, Willamette Valley, $20: Florent-Pierre Merlier is on quite a run for this Salem, Ore., showpiece. Here is one of the year’s most complex whites, a combination of tropical and orchard-fruit flavors that finishes dry with minerally notes. 45. HAT Ranch Winery 2014 estate dry moscato, Snake River Valley, $18: Tim and Helen Harless moved to Idaho’s Sunnyslope Wine District from Texas to make wine. Four years in, they’ve released one of the nation’s most remarkable dry muscats. 46. Clearwater Canyon Cellars 2013 carménère, Washington, $28: Lewiston, Idaho, winemaker Coco Umiker has crafted a head-turning carménère from Phinny Hill Vineyard in the Horse Heaven Hills. It is a spicy red loaded with ripe plum and blackberry flavors. 47. Alexandria Nicole Cellars 2014 Destiny Ridge Vineyard Shepherds Mark, Horse Heaven Hills, $24: Owner/winemaker/grower Jarrod Boyle’s signature white is this Rhône-style blend of Roussanne, Marsanne and Viognier. 48. Willamette Valley Vineyards 2012 O’Brien pinot noir, Eola-Amity Hills, $100: A lot of great pinot noirs came out of the 2012 vintage, and this is among the finest. 49. Karma Vineyards 2011 brut, Columbia Valley, $50: This Lake Chelan winery focuses on bubbly, and it has produced a bone-dry sparkler with aromas of tropical fruit and flavors of lemon, brioche and pineapple. 50. Bainbridge Vineyards 2013 Müller-Thurgau, Puget Sound, $18: Under the leadership of winemaker Betsey Wittick, this longtime Kitsap County winery is showing new energy, as exemplified by this bright German white. It’s a short ferry ride away.